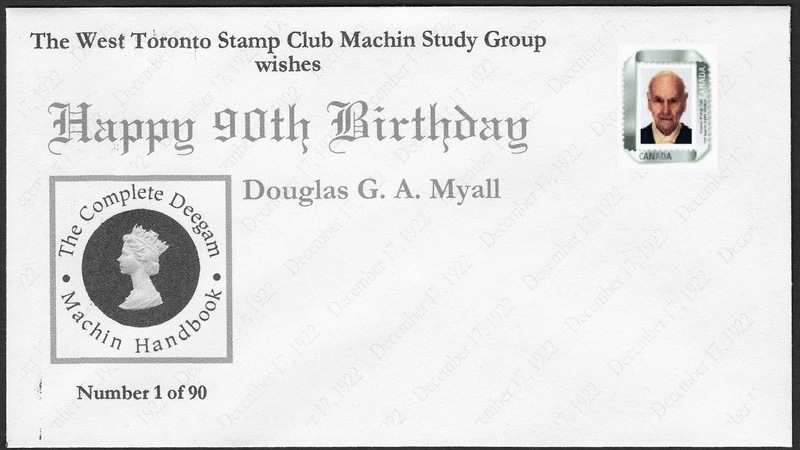 Douglas Myall, well-known to Machin collectors for his Complete Deegam Machin Handbook and numerous other contributions to the field, will reach his 90th birthday on December 17. 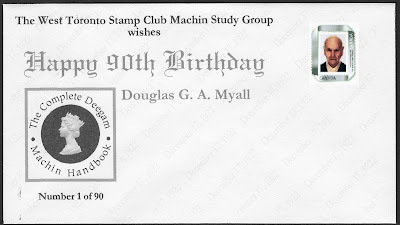 The Machin Study Group of the West Toronto (Canada) Stamp Club is going to honor Myall by preparing a personalized postage stamp picturing Myall and a cacheted cover postmarked on December 17 with the Royal Philatelic Society of Canada’s “125 years of Canadian Philately” cancel. Covers are available from the Study Group at $2 each (Canadian dollars) and single picture postage stamps at $1 each, plus appropriate postage. The covers can be addressed and mailed directly to you (with additional postage as necessary to addresses outside Canada), or unaddressed and sent in a separate cover. A very limited supply of stamps and covers will be available, so if you are interested, please reserve them soon. To reserve them, contact Vijay Vijayakumar at machincollector@gmail.com or Garfield Portch at garfield.portch@gmail.com. Be sure to indicate your country of residence so they can give you the proper postage costs. Payment can now be made through Paypal. Please use garfield.portch@gmail.com and in the message column mention "90th Birthday cachet"
Don't forget to email first to be told what shipping cost to include in the total. With due congratulations to Douglas for the double milestones of a 90th birthday and Deegam Report No.100, it does raise the question that Doug himself infers in his opening paragraph of that Report - who does take over the Deegam Handbook in the end? Does anyone who has the time and willingness also have the depth of knowledge. Doug's work is the bible for so many of us and his helpful emails when asked questions are another font of knowledge. Thanks for what you have contributed to our hobby Douglas and best wishes for your 90th and hopefully many more beyond. A Harrison type proof could also be appropriate.